The history of our Victorian Inn centers around one family and their love for Cape May, NJ. At 79, Antoinette became the oldest parking lot attendant in Cape May at the Presbyterian Church on the corner of Hughes and Decatur Streets, and her dedication to the job let her keep that title until her retirement at 89. 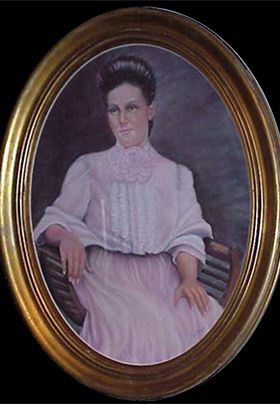 While she lived in Cape May, she often sought medical aid from her physician, Dr. Hughes, who was a descendant of a prior owner of the inn’s property, Humphrey Hughes. In 1991, a local bank president put his then-residence up for sale. 717 Washington Street was purchased by Deanna Brown and her sister and brother-in-law, Judi and John Anderson. Although the house was in excellent structural shape, it was totally bare from wall to wall. Within six weeks, on June 22, 1991, Antoinette’s Guesthouse was opened for business, named in loving remembrance of Deanna’s grandmother Antoinette. The house provided daily and weekly Victorian apartments and suites to the public, thus filling a need for family friendly accommodations. Ellis Eldredge in 1891 purchased the right lot. In 1893, Charles Edmunds purchased the property. The house at 717 Washington was built during this time period. In 1904, the left lot was sold to Our Lady Star of the Sea and the Tremont Hotel was torn down by 1910. Jere E. Chambers from 1929 to 1935. Jere was Postmaster at Cape May 1933-1936. The Stevens family from 1938 to 1964. Elizabeth Stevens was the mother of Ralph Townsend Stevens (1894-1952). Ralph and his wife Charlotte owned the house from 1940-1964. Mrs. Stevens was very civic minded. She was president of the Cape May Board of Education for many years. Regent and active members of Daughters of the American Revolution, Mr. Stevens was an influential politician. He owned the Cape May Sand Co., was a Cape May County Freeholder from 1926-1951, and State Assemblyman in 1923. Stevens rented out apartments in this house while he and his family lived at 30 Gurney Street (known as the John Wesley Inn). In late 1993, Deanna decided to change careers from a Computer geek (24 years) to a full time innkeeper and open Antoinette’s Guesthouse (now Antoinette’s Apartments & Suites) year-round, and therefore making Cape May her permanent home. Prior to moving here, most of her time was spent as a commuter from North Jersey to New York City and White Plains, NY. She started as a computer programmer trainee and worked her way up to middle management, holding a vast variety of computer-related positions. If Deanna was going to make a life for herself here in Cape May, she decided to meet people. She quickly got involved in the community as an active volunteer and leader. She has been on the board as Director for the local Chamber of Commerce since 1994; served as Treasurer of the Cape May County Art League and Greater Cape May Historical Society (GCMHS); and was President of the GCMHS from 1997-2000. She was active as Vice President of the South Jersey PC Users group. In 1994, she became the founding President of the Victorian Guest Accommodations (VGA) promoting family oriented apartments and suites. In September 1998, Deanna officially became the sole proprietor of Antoinette’s Apartments & Suites and took over the partnership from her sister, Judi and John. While running a 70 window, three story building, Deanna has learned to appreciate home maintenance skills. She has completed over 240 hours of training in carpentry, plumbing, electrical, and general home maintenance at their local Technical Vocational school. These skills have helped her become more proficient at maintaining Antoinette’s Apartments & Suites, but she has a long way to go. Deanna has become very adept at hand-crafting Victorian Lampshades (self taught) and upholstery work of over 90% of her furniture. Friends have helped her with all the handmade curtains and drapes that add that special home feel throughout the house. During the winter of 1996, Deanna was joined by her 80-year-old father Fred who only planned to stay the winter. He fell completely in love with the town and rarely left it to visit his other four children. Occasionally, you would find him sitting on the front porch chatting with all the local people and talking to our guests. Until he lost most of his eyesight, Fred picked up a hobby of assembling wooden doll houses and boat kits of all sizes. A passerby would stop and look at his dollhouses that line the front porch at Antoinette’s Apartments & Suites. It is now a local stop for our trolleys and horse drawn carriages day and night. After seven years in Cape May, Fred moved to North Jersey to live with his daughter in the house where he raised his family. In July 2004, we lost Fred at the age of 88. His models outlived him. When you go away on vacation, do you just want to curl up and read a good book? Well, Antoinette’s Apartments & Suites provides you with such an alternative. Children can choose from over 100 storybooks that are theirs for the asking. For the adults, each guest suite has a collection of newsletters and short stories that have become a favorite reading pastime for guests. The most memorable book in our collection is “Life with Antoinette,” written by the innkeeper Deanna in 1994. The stories were told to her by Antoinette’s daughter Maria and the book is a wonderful collection of short stories of Antoinette’s life experiences. Our favorite is about how in 1896, Dominic, her future husband, fell in love with her at the age of 5 and pursued her till she finally married him at the age of 15. This is just one of the many stories shared in this storybook. Thank you for our pleasant stay at your house, and especially for all your help in finding out about my Cape May ancestors. It was really neat to stay in the house of my great uncle and aunt, Humphrey Hughes VII and Eliza Eldredge Hughes. May God bless you and your work with the Cape May Historical Society. Thank you again for everything. Sue & Ed Z. Lake Jackson.